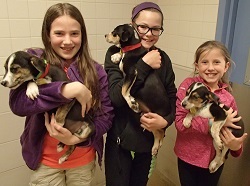 Boy Scouts and Girl Scouts are invited to visit the Wisconsin Humane Society for a fun-filled evening to learn all about animals and the work we do to find them loving homes. Make a cool cat toy, learn the basics of dog training, take a behind-the-scenes tour, and meet some furry and fuzzy guests! Included in your reservation is a resource guide with activity ideas to help you reach your goals for animals. Exclusive Wisconsin Humane Society patches are available for purchase at the time of registration. Your visit on Scout Night has a direct connection to the Daisy’s 5 Flowers, 4 Stories, 3 Cheers for Animals Journey, the Brownie’s Pets Badge, and the Bear Scout's Critter Care Adventure. 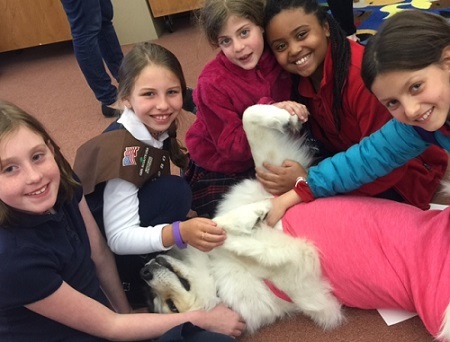 If you have specific, animal-related goals that your troop is working toward, please let us know, as there may be additional resources we can provide. Thursday, October 18 | 6:00 - 7:30 p.m.
Wednesday, November 7 | 4:30 - 6:00 p.m.
Wednesday, November 21 | 6:00 - 7:30 p.m.
Thursday, December 13 | 6:00 - 7:30 p.m.
Wednesday, January 16 | 6:00 - 7:30 p.m.
Wednesday, January 23 | 4:30 - 6:00 p.m.
Thursday, February 7 | 4:30 - 6:00 p.m.
Wednesday, February 20 | 6:00 - 7:30 p.m.
Wednesday, March 6 | 6:00 - 7:30 p.m.
Thursday, March 14 | 4:30 - 6:00 p.m.
Wednesday, March 20 | 6:00 - 7:30 p.m.
Wednesday, April 10 | 4:30 - 6:00 p.m.
Thursday, April 18 | 6:00 - 7:30 p.m.
Wednesday, April 24 | 6:00 - 7:30 p.m.
Wednesday, May 8 | 6:00 - 7:30 p.m.
Wednesday, May 16 | 6:00 - 7:30 p.m.
Wednesday, May 22 | 4:30 - 6:00 p.m.
Wednesday, October 17 | 6:00 - 7:30 p.m.
Wednesday, November 14 | 6:00 - 7:30 p.m.
Wednesday, February 6 | 6:00 - 7:30 p.m.
Thursday, February 7 | 5:00 - 6:30 p.m.
Wednesday, April 3 | 6:00 - 7:30 p.m.
Thursday, April 4 | 5:00 - 6:30 p.m.
Wednesday, April 17 | 6:00 - 7:30 p.m.
Thursday, May 9 | 5:00 - 6:30 p.m.
Wednesday, May 15 | 6:00 - 7:30 p.m.
Thursday, November 15 | 5:30 - 7:00 p.m.
Wednesday, December 5 | 5:30 - 7:00 p.m.
Thursday, January 10 | 5:30-7:00 p.m.
Thursday, January 24 | 5:30-7:00 p.m.
Wednesday, February 6 | 5:30-7:00 p.m.
Thursday, February 21 | 5:30-7:00 p.m.
Wednesday, March 13| 5:30-7:00 p.m.
Thursday, March 28| 5:30-7:00 p.m.
Wednesday, April 17| 5:30-7:00 p.m.
Thursday, April 25| 5:30-7:00 p.m.
Wednesday, May 15| 5:30-7:00 p.m.
Thursday, May 23| 5:30-7:00 p.m.